Laddu is probably one of the most popular sweets to be offered at the traditional Indian religious ceremony or special occasion. All the more reason why you will find this sweet delicacy at every Indian Wedding that you attend. Thing is, Laddu may not taste the same each time you try it because of the recipe varieties available. This sweet is made from a dough ball of flour, sugar and a variety of other ingredients. These will vary depending on the geographical location as well as the tradition in how to make it by the host. The fabulous advantage of laddu is that because it does not contain meat, it is a sweet of choice for all tastes. Boondi Laddu, is named after its geographic origins, in North India. It is enjoyed across the entire Southern sub-continent too. 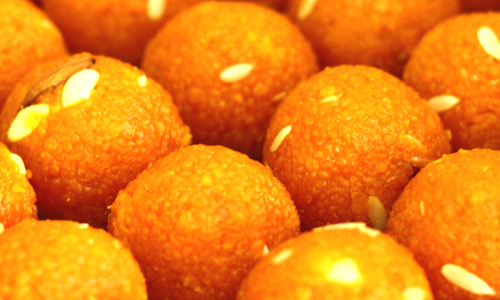 Besan Laddu, is made from Besan flour – chick pea flour otherwise known as gram flour. This is roasted in ghee until it is a golden brown colour and it has a delicious nutty flavour to it. Sugar and pistachio are usually added to it. This version has a remarkably long shelf life and provided ingredients are kept separately is gluten free. Coconut Laddu, is as it says made with coconut added to the recipe. This recipe goes back in time as it was used by the warriors going out on expeditions. This was because they needed food that would last. Laddu with edible gum is now common and is given to lactating mothers as this helps in the production of their milk. Laddus are often used for religious festivals, special occasions like Asian Weddings and even given as religious food offerings at Sikh & Hindu temples. • Grind sugar with cardamom seeds into powder. Chop almonds and cashew nuts into small pieces. Keep aside. • Add Semolina and roast for 2 to 3 minutes, add chopped nuts and mix everything thoroughly. Roast for 1 to 2 mins. Add powdered sugar and mix well off the heat combining all the ingredients. • Allow besan mixture to cool down for five minutes and then add sugar powder and mix well until the sugar combines. Cool down for another ten minutes and then take a small portion of the mixture and press into the Laddu shaped ball. Take care as the mixture will still be warm. • If the mixture crumbles add 1 tbsp. of melted ghee at a time and try again until you are successful. • Place the laddu into a box or onto a plate and let them dry. If the laddu is a still soft are drying for a while, don’t worry, they are fine. • Store, arranged in a single layer in an air tight container. These laddus will last for almost a month, that is if they haven’t been eaten by then! If you use besan flour that is coarser than semolina, simply exclude the semolina. Then add the same amount of besan to the mix. Mix and match by trying a variety of different nuts or nut mixes that you can think to make it more interesting. Whatever you do Cardamom powder is what make the laddu unique. Don’t skip it or decide to remove it from the recipe. Otherwise noone will believe that its laddu ! Always sieve the besan before you heat it, you may otherwise miss any big lumps which will devalue this treat. Heat dry ingredients on a low heat only and it is really important to continue stirring as the there is a real risk of the ingredients burning. Add coconut and other tastes suitable for sweet treats to create your unique laddu. When varying the recipe, write down what you have done. There is nothing worse than creating a star food or sweet only to not be able to make it again because you didn’t write it all down. Followed by the discovery that you have forgotten what you did.